Kestrel Pocket Meters are considered the finest quality handheld wind instruments on the market; with their affordability, dependability and extreme accuracy, it is easy to see why. Kestrel wind and weather tools are available in a variety of models and colors and are graded for beginners as well as advanced users. Weather meters are used to determine various weather conditions in any environment. They detect and report advanced wind data such as max gust, average speed and temperature data including the wind chill. Kestrel pocket meters serve the needs of many including outdoorsman, industry professionals, storm chasers and meteorological enthusiasts. Pocket weather meters are great tools to know exactly what is going on around you. 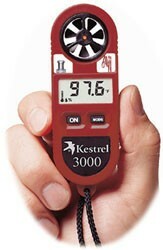 Although all of the Kestrel meters are great weather monitors, our top-seller is the Kestrel 3000 Pocket Weather Meter. This weather meter gives weather conditions in real-time so you never have to wonder about what Mother Nature has in store. The Kestrel 3000 Pocket Weather Meter measures a variety of different atmospheric conditions including: Wind Speed, Max Wind Gust, Average Wind Speed, Air/Water/Snow Temperature, Wind Chill, Relative Humidity, Heat Stress Index and the Dewpoint Temperature. Aside from measuring the current weather conditions the Kestrel 3000 Pocket Weather Meter boats a large list features. One of the best features about the weather meter is the wide operating range. It is functional in almost any place on the Earth, accurately presenting weather conditions in hot and freezing climates. Some of the other features the 3000 meter has is a quick response external thermometer so you are always aware of the temperature outside. The humidity can also be checked very easily with the humidity sensor. The meter provides high accuracy when determining weather conditions so individuals always have an up to date report on the weather. The 3000 Pocket Weather Meter is made in the U.S.A. and although it has been put through rigorous testing including a drop test it comes with a 5-year warranty should anything happen to the meter. The meter was made to be used in rough and rugged conditions so it is waterproof and it does float if dropped in water. The 3000 pocket weather meter comes ready to use out of the box. The meter is already stocked with a coin cell battery that has an average battery life of 300 hours. Along with the battery, the meter includes a neck lanyard that makes it easy to carry and hard to misplace. Each Kestrel pocket meter purchase comes with a Kestrel Certificate of Conformity to ensure you benefit from the finest quality weather meter. The ease of use, accurate reporting and hand-held size of Kestrel meters makes them a must on any outdoorsman or weather enthusiast’s packing list. Using Portable Wind Meter you can measure the weather condition in a while. You can carry a portable Wind Meter anywhere. Wind meter measure the speed of wind,desire the direction of wind,amount of rain fallen in a specific time period & many more. Is pocket weather meter similar to portable wind meters and rain gauges? I am looking for such thing.Managing giant cabled weather meters is really tough job to do. I will prefer this blog because it has much more informative stuff.Which Woods Work Best for DIY Home Remodel Projects?